Mercedes-Benz mbrace® is a collection of services and features – available in four distinct packages – that makes your ownership experience smarter, safer, more convenient and more fun than ever before. Enjoy the base package, mbrace® Connect, standard for five years with any new Mercedes-Benz. It begins with mbrace® Connect, the standard mbrace® package that powers many of the features of Mercedes me. 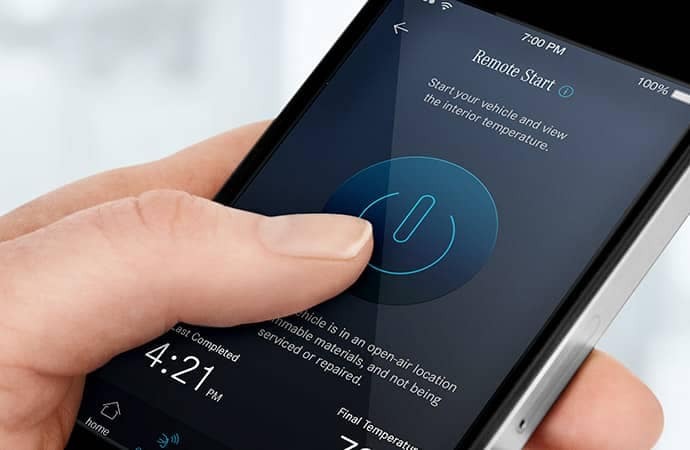 This is what allows you to start your car, lock your doors, or send an address to your navigation, all from the Mercedes me app. Plus, you can easily connect with Roadside Assistance or send diagnostic data to your dealer. Lock or unlock your vehicle from virtually any location with the Mercedes me app on your iOS or Android smartphone. You can also do this with a phone call to the mbrace® Response Center (operator assistance requires the mbrace® Secure package). Get vehicle-related reminders and notifications from Mercedes-Benz via messages sent to your smartphone. The mbrace® Secure package uses cutting edge technology to keep you safe inside your car, and informed when you're not. So if you're ever in an accident, someone is on the way, and if your vehicle is ever stolen, you're the first to know. With mbrace® Secure, if an air bag or seat-belt Emergency Tensioning Device is activated, your Mercedes-Benz can automatically place a call to the mbrace® Emergency Response Center, including reporting your location, even if you can’t. The GPS system that’s built into your Mercedes-Benz can assist authorities with stolen vehicle recovery. Once you file a police report, a phone call to mbrace® offers a safe and effective way to help the police locate and recover your car. Lock or unlock your vehicle from virtually any location with a few taps on your smartphone. Or if you’ve locked your smartphone in the vehicle, borrow a phone to call the mbrace® Response Center, and an agent can unlock it for you. asily contact your preferred dealer, or receive assistance in finding one that’s nearby. With the push of a button in your car, a friendly mbrace® operator can not only look up the dealer for you, but also route your call directly to the desired department. If you find yourself unable to drive, mbrace® can help you contact a family member or taxi company for a ride home. At Mercedes-Benz, we know that time is the greatest luxury of all. With an mbrace® Concierge package, you have your own personal assistant who can help you with dinner reservations, event tickets, travel arrangements, and more. 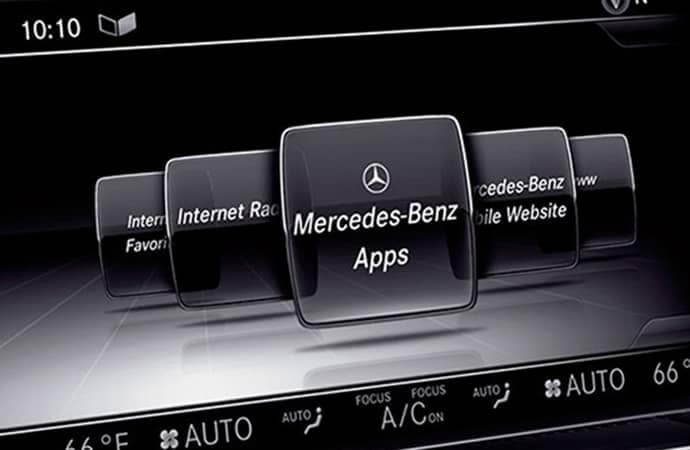 And you can access them anytime using the i-button or the Mercedes me app. The mbrace® Entertain package makes driving your Mercedes-Benz even more enjoyable by providing a never-ending soundtrack to your ride. Choose from millions of stations, playlists, and podcasts from around the world, all searchable by location, genre, and name. Listen to more than 100,000 radio stations and 2 million podcasts from around the world, searchable by location, genre, station type, station name and even station call sign. WiFi  Your vehicle becomes a 3G WiFi hotspot allowing you to connect up to four devices to the Internet. Mercedes me is the ultimate ownership experience from Mercedes-Benz. 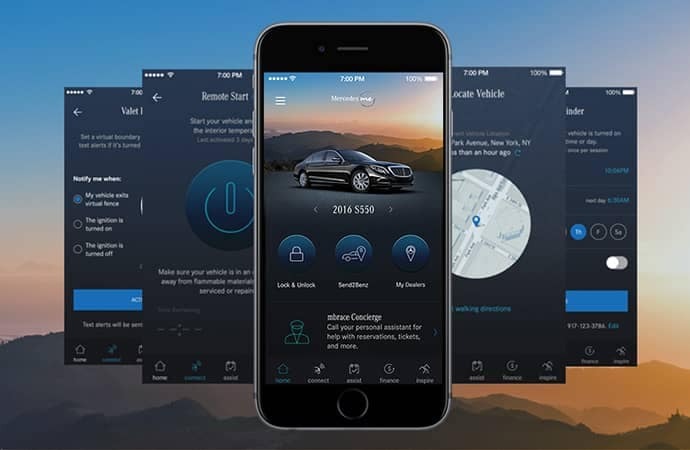 Powered by mbrace®, Mercedes me connect allows our drivers to utilize many of their free mbrace® Connect features, including Remote Start, Lock/Unlock, Send2Benz, and Vehicle Monitoring - all from the Mercedes me app. Plus, you can log in to view your manuals, maintenance info, how-to videos, financial terms, and more. Discover more on Mercedes me, and sign up to get started. How do I become an mbrace® subscriber? To subscribe to mbrace® Connect, you must own a MY16 or later Mercedes-Benz equipped with mbrace® hardware. 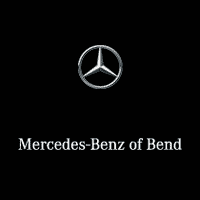 For more information, stop by a Mercedes-Benz dealership for personal assistance. How do I activate mbrace®? If the system has been activated, the mbrace® service button will light up for 5-10 seconds after the ignition has been turned on. This indicates that the buttons are functional. They will soon turn off and then light up again with the next ignition cycle. Do I need mbrace® to have a Mercedes me account? No. Mercedes me is free for everyone, regardless of your vehicle or mbrace® account status. However, customers with mbrace® Connect or mbrace® Concierge will have access to additional features within Mercedes me. Do you need my credit card to activate mbrace®? 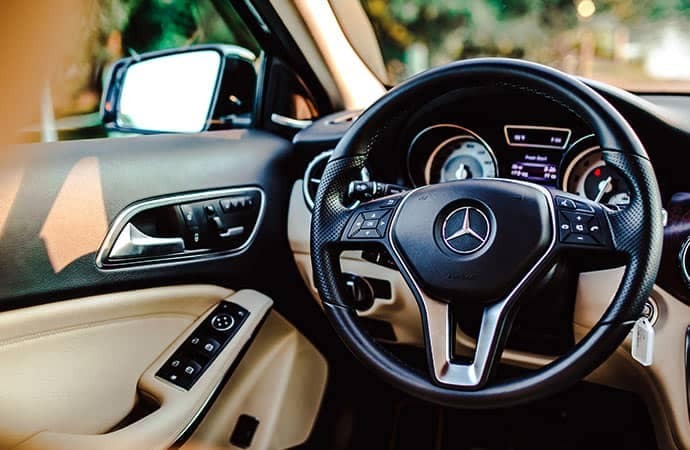 You do not have to provide a credit card to activate mbrace® Connect, the standard package that includes a wide range of remote access features, remote diagnostic test and numerous Mercedes-Benz Internet-based applications. 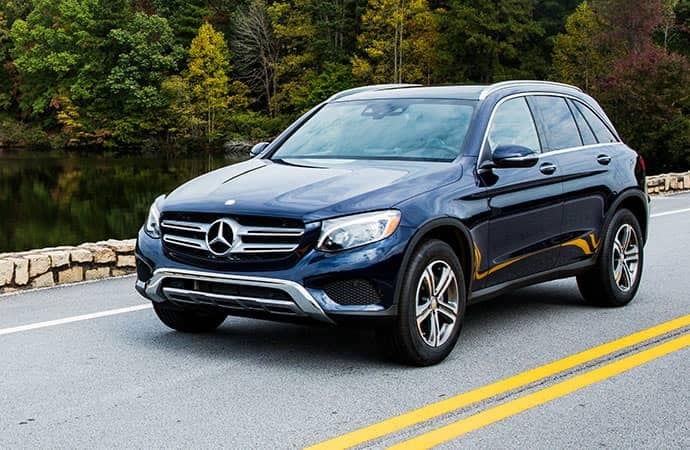 All eligible MY16 or later MBUSA vehicles include mbrace® Connect service standard for five years. Where is mbrace® service available? The service area coverage for vehicles sold and registered in the United States and Puerto Rico is limited to the 50 states, District of Columbia and Puerto Rico. When traveling from the U.S. to Canada or Mexico with your Mercedes-Benz vehicle, services may be limited or unavailable. How do I link my mbrace® account to Mercedes me? When registering with Mercedes me, you will be asked to link your vehicle to your mbrace® account by providing your mbrace® account number and your 4-digit mbrace® PIN. If you've already created a Mercedes me account, select "Vehicles" from the main menu, scroll to the mbrace® section, and click "Link mbrace® Account." You can reset your PIN (Personal Identification Number) by pressing the i-Button in the vehicle or by calling the mbrace® Response Center toll-free at 866-990-9007. You will be required to provide some account information in order to verify your identity. How does mbrace® Concierge work? The mbrace® Concierge service provides an extra measure of luxury and convenience with personal assistance available at the touch of a button or a phone call, 24 hours a day, seven days a week. mbrace® Concierge allows you easy access to a broad range of personalized services. Requested services are fulfilled by a Concierge Specialist and billed directly to your credit card by the merchant involved in the transaction. The Concierge Specialist has access to your credit card on file and will verify your mbrace® 4-digit PIN for security reasons. What types of services are available through mbrace® Concierge? Is mbrace® Concierge available to me 24/7? Yes. mbrace® Concierge services are available 24/7 through the i-Button in your Mercedes-Benz or through the Mercedes me mobile app on your iPhone or Android device. And, you don't have to be in your vehicle to use concierge services. Mercedes-Benz mbrace® services are provided by Verizon Telematics Inc. on behalf of Mercedes-Benz and are subject to the mbrace® Terms of Service which can be found on www.MBUSA.com/mbrace® or by calling 877-570-0367. mbrace®, is compatible with select Apple iPhone® models running iOS 4.2 or later, and Android-based phones running OS 2.1 or later. Available on select 2016 and newer model lines. Check with dealer for details. Requires COMAND® system with navigation, which is optional on some model lines. Yelp is a registered trademark of Yelp! Inc.
 Morningstar is a registered trademark of Morningstar, Inc.
 mbrace® Connect five year complimentary services begin on the date of new vehicle purchase. Balance of complimentary service can be transferred with vehicle to subsequent owner. Limit one trial per service per vehicle owner. Month-to-month, annual and/or extended term payment(s) are automatically billed to customer’s credit card unless service is cancelled prior to the end of the trial. Pricing for extended term subscriptions can be obtained by calling 877-570-0367. Certain restrictions and limitations of service apply. iHeartRadio is a registered trademark of Clear Channel Broadcasting, Inc. Available on most 2016 and newer model lines. Restrictions may apply.